Bakhåll, P O Box 1114, 221 04 Lund, Sweden, fax: + 46 +46 12 61 82, order@bakhall.com. 240 pages, 137 X 152 mm, soft cover with flaps, sewn, printed on high quality paper, illustrated with artworks and photos by Yoko. Including international shipping & handling! Legendary underground comics artist Robert Crumb is a passionate collector of 78 rpm records. We invited Mr. Crumb to choose from his huge collection to compile his album of favorites, and this is the result: A wonderful parade of happy music from the early  the golden!  days of recording. 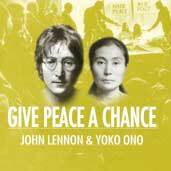 John Lennon & Yoko Ono: "Give Peace A Chance"
“All we are saying—is Give Peace A Chance!” was recorded in May of 1969 on a portable tape deck during John Lennon and Yoko Ono’s famous “Bed-In” to promote world peace. Released on record a few weeks later, it quickly became an anthem for peace-loving people of all countries, and still stands as a slogan for peace that is fresh and relevant as ever. 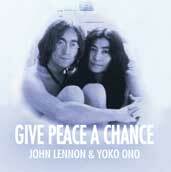 This book, edited under Yoko’s supervision in 2007, is an anthology of photos, documents and quotations culled from the couple’s many inspiring peace campaigns, spanning from the late 1960s to Yoko’s peace work in Lennon’s memory in recent years. 176 pages, 146 X 146 mm, hard cover, sewn, printed on high quality paper, illustrated with drawings by John and photos. Included with the book is a Bonus DVD containing documentary footage from “Bed-In” (1969) and Yoko’s film “Onochord” (2004). Playing time of the DVD is 17 minutes. The DVD is in the PAL system. "Imagine Yoko" is a book of ideas--provocative, engaging, enjoyable. In this unique edition Yoko Ono shares her inner thoughts with us on such themes as what art really is and how art can make the world a better place. This brilliant book also gives us an unclouded insight into Yoko's artistic realm and guides us through her work. So what is art? Art is to imagine. Art can be the saviour when politics fail. Art is a means of survival. The book is an anthology of aphorisms and essays that Yoko has verbally communicated or written over the years, compiled and edited by Bakhall's founder Orjan Gerhardsson in close cooperation with the artist herself. Deluxe hard-cover edition, 128 pages, printed on high quality paper with many color illustrations. Included with the book is a bonus DVD with samples from two of Yoko's films: Film No.4 (Bottoms) and Film No. 13 Fly. Playing time: 14 minutes. The DVD is in the PAL system. 1. SOUL GOT OUT OF THE BOX - a 32 page booklet presenting some of the artworks from the exhibition. 2. INTERVIEW CD - a CD with a recorded interview with Yoko Ono giving her inner thoughts on many of her artworks. 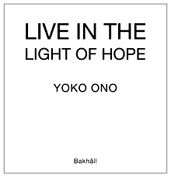 The interview was conducted by Bakhall's publisher Orjan Gerhardsson in Yoko's home in New York on February 28, 2003. Playing time: 18 minutes 13 seconds. 3. SONG CD - a CD with two songs from Yoko's album Blueprint For A Sunrise: "It's Time For action" and "I'm Not Getting Enough". Playing time: 7 minutes 30 seconds. 4. A CARD WITH A HOLE - ... with the text "A hole to see the sky through" - a replica of Yoko Ono's artwork from 1964. Box and booklet layout by Orjan Gerhardsson. Everything contained in this box is copyrighted by Yoko Ono. All rights reserved. A book of short stories and poems by John Lennon, originally published in 1965. Illustrated with his own drawings. Cover photographs from Lennon's visit to Sweden together with the Beatles in 1964. Bilingual Swedish-English edition. The entire text is represented both in the English and the Swedish language. 128 pages. No bonus CD in this second print run of the book. Grapefruit is Yoko Ono's legendary collection of her quirky, subversive, surprising instructions for art and life. First published in Tokyo as a limited edition in 1964 and later enlarged and widely reprinted in 1970, Grapefruit is now a modern art classic. "Make a hole. Leave it in the wind." "Draw a map to get lost." "Listen to the sound of the earth turning." Add Grapefruit to your collection today by ordering directly from our website. We accept payment by PayPal. Woolgathering is a book of short stories by Patti Smith. It was originally published in 1992 by Hanuman Books. This hardcover edition is bilingual Swedish-English (Swedish text on the right hand pages, English text on the left hand pages). A very fine book, as one review puts it: ”this is her greatest piece of writing, period” and ”she is a free form channeler of the muse of the great mystery itself”. 128 pages. Hard cover, high quality paper, sewn sheets, clothed spine.